LaMarr Woodley was back on the playing field for the first time in weeks on Sunday, but didn’t do much, making just one tackle while it was James Harrison getting the spotlight with three sacks. Woodley said after the game that the hamstring that kept him out the past few games is going to be an issue for the rest of 2011, and into the postseason. Jason Worilds is the backup at left outside linebacker, and gained some important playing time with Woodley on the sidelines. Woodley said he and Worilds were supposed to basically split the snaps on Sunday, and said that his hammy was tired which is why he was limited for the most part. “I plan on going out there and playing again on Thursday but you have to take the (cautious) approach,” the LB said. 8 Comments on "Woodley Says Hamstring Will Be Issue the Rest of 2011"
Where all the haters today? Ithought this was a bad team? When you read/refer of/to us “haters” why do you wait until a great win to speak up? Seriously, don’t be afraid to put yourself out there in the moment, people. I’m not and I get ripped for it and probably rightfully so. But people who hide until the opportunity is picture perfect to pipe up to me are spineless. You’re followers at best. 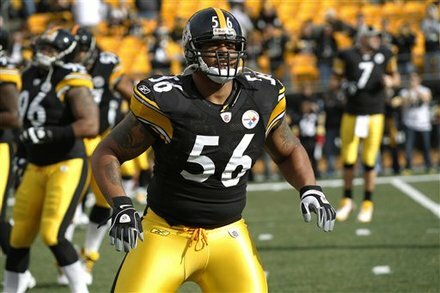 About the Steelers, I’ve been harsh and rightfully so at times (EVEN the team considered the K.C. win a “loss” and a “disaster” of a game!) I’ve also been sick with an inner ear infection all week and then my 8 month old got sick so that’s why I haven’t been on here (in case you think it’s because I’m hiding or something). I still stick to my guns about the team having some issues at certain areas (but have obviously dropped the impulsive extreme language immediately following a game). I have noticed, throughout the NFL, that MOST teams, if not ALL teams, really and curiously have inexplicable losses/performances at times…I.E., N.O. losing to the Rams (weeks ago), Dallas losing to Arizona, Oakland losing to Miami, Atlanta not being able to neat a quarterbackless Houston team, etc., etc. So for that, I applaud the Steelers for remaining consistent for the most part. I do feel that when the Steelers are playing their best, no one can beat them. That’s why I get so frustrated because they have laid a couple of eggs even in some wins. But, as just mentioned, everyone else seems to do it and do it egregiously worse so when you consider the whole pie, the Steelers are easily one of the top three teams in the NFL. Can it translate to late January/early February success? If BB gets the type of pass protection that other elite QB’s get AND they remain somewhat balanced on offense…YES! Well said Jay. This team is a tough team and its great to see them improving as the year progresses. There are still things that need to be fixed (Consistency in the redzone, consistent pass rush, kicking game, ect. ), however every team has their flaws, including the undefeated Packers, I’m content that our flaws can be fixed with hard work and preparation. This is a great win beating our divisional foes, yet the Steelers mustn’t become complacent. It is a short week and we have another AFC North divisional game ahead of us. The Steelers can not take the Browns lightly. Hillis is starting to return to form and the Browns defense is far better than they were a year ago. Haters?? I guess speaking your mind and blasting a team when they play poorly is now being a “hater”. Whatever. Yes,our Steelers played a very good game yesterday against a much improved division rival in Cincy. I was very encouraged by what I saw going down the stretch. Do the Steelers still have weaknesses? YES! As does every team. I think its probably too late in the season to fix the Steelers weaknesses, its just a matter of doing enough in other areas to mask these short-comings. 9-3 is a great place to be, and 10-3 is better. Lets hope this performance carries over into Thursday’s game against an “inferior” opponent and the Steelers can put themselves in Playoff clinching position. Where you been Ralph? I have been killing Jay and others on here for a while and you show up out of the blue!! I think it is just human nature to lash out when the team you root for does not play well. I assume Jay’s ear infection was caused by him screaming at Arians and Tomlin all the time. No worries Jay, I do that a lot as well. Hope you and your child are feeling better. I am starting to love the 3 TE sets with Wallace in the game. Tough to defend. You have to put a safety over the top with 17 or you are toast. The Sanders kid could be a diamond in the rough and he and Johnson are big enough they are like having 2 extra tackles in the game. I wonder if Arians is finally going to realize that running the ball, specifically in the redzone, actually works. I don’t want to get too excited though. I remember a Thursday night game against Cleveland a couple years ago when Arians decided to throw it 40 times in 40 MPH winds and we lost. Gentlemen, your responses are well reasoned and well expressed. All of us here want the Steelers to do well. Identifying and analyzing the team’s flaws does not mean we are negative — just the opposite. In fact, that is exactly what NFL coaches are paid to do: see what’s imperfect and make it better. Compared with other blog sites, the comments posted here are usually among the more thoughtful and enlightened. In that spirit, consider Woodley’s hamstring injury in the article above and the long list of our walking wounded in the preceding article. Then, remember that we are playing Thursday night, on limited rest. All of which will make the Browns game more challenging than the teams’ respective records might otherwise suggest. I realize that the Browns have their own injuries to deal with, but my concern here is for our defense, which is more than a little long in the tooth. We will probably beat the Browns, as everyone seems to think. But these mounting injuries indicate that the road to the Super Bowl this year is going to be a long war of attrition for the Steelers. Not a happy prospect for a team that is one of the oldest in the NFL. During the pre-season, Tomlin and the Rooneys took a calculated risk that we could get to the Super Bowl again by extending our veterans one more year. It seemed a reasonable gamble at the time. Now, in the games ahead, we are going to see whether that gamble pays off. Very well, then, we’ll all agree to….agree then…As for next week, Mark and I will bash the Steelers and Arians relentlessly, Ralph, you continue to hide and Peter, be sure to make fun of Mark and I, The Tony take the “the” out of your name…Tony’s just fine…, Dr. George, continue with your Thurston Howell impressions and Thomas Crowley, just continue being a douche bag. We’ll reconvene here next week, same steel time, same steel channel!